Adapts the Bethel Sozo Tools to educational issues by applying the Sozo techniques with students who have learning disabilities or poor academic performance. This teaching adapts the International Bethel Sozo Tools to educational issues by applying the Sozo techniques with students who have learning disabilities or poor academic performance. Dr. Barsch has been using this technique with at-risk students in high school with startling results. Once you have listened to Dr. Barsch’s presentation, you will want to supplement it with the Educational Sozo Manual. You don’t have to be a professional to see freedom for yourself, your children or your students. 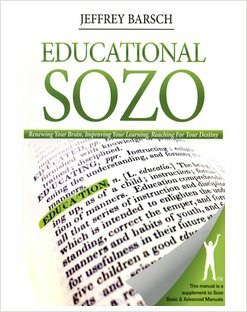 This is a book about the brain, and how Bethel Sozo techniques can help prepare wounded learners to grow and prosper. Dr. Barsch has been using these adapted Sozo techniques with at risk students with startling results. This product is highly recommended by Dawna De Silva, Sozo Ministry Founder, for bringing freedom to struggling students. *This manual is a supplement to Sozo Basic & Advanced manuals and compliments the Educational Sozo CD. Jeffrey and Katy Barsch are directors of the Ventura Healing Rooms/Sozo Center in Ventura, California. Prior to starting the Ventura Healing Rooms in 2002, Jeffrey served on staff at a local church for five years in Christian counseling and church prayer ministries. Jeffrey taught in colleges and universities for thirty years and has a doctorate specializing in educational psychology and special education from University of Southern California. Katy worked for fifteen years as an elementary school teacher with a particular interest in teaching children to read. Katy has a bachelor’s degree from CSU Northridge.